5 ingredients + spices + water. That’s it. And it’s thick and tasty and even enjoyed by a squash-hater (Dad). And it’s healthy and inexpensive and stretches. And you can eat it for breakfast, lunch or dinner. (You might think I’m talking pancakes, but I’m not!) Gluten-free, vegan and very awesome. Let’s make this magical concoction. Creamy, piping hot, and full of flavor, this healthy soup provides your body with fiber, potassium, carotenoids and antioxidants. This means a healthier heart, cancer fighters, and healthy nervous and immune systems. It’s a power food with the consistency of buttery happiness and the color of a sunset. It’s all good. And super easy to make and eat this awesome soup. Don’t focus on the healthy and be mesmerized by the awesomity of this power house meal. Serve with crusty bread, a salad or even a potato on the side for the ultimate warmth on a winter day. Spices: 2 TB olive oil, 1 tablespoon chili powder, 1 teaspoon salt, few dashes pepper, 1 tablespoon cinnamon, 1/2 teaspoon of each: ginger & cumin, and 1/4 teaspoon of each: nutmeg, cloves. Preheat oven to 400 degrees. Line 2 rimmed baking sheets with a nonstick baking mat, parchment, foil or just spray. Peel and chop squash into 1-inch chunks (-ish). Chop apple, onion and carrots into bite-sized chunks, too. 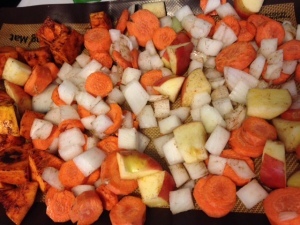 In a large bowl, toss veggies/fruit chunks into olive oil and spices until coated. (I had to do this in 2 batches.) 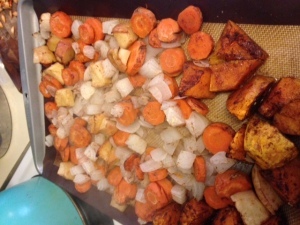 Then, spread the chunks out on the baking sheets as one layer (evenly roasts this way). Roast for 35 minutes, or until cooked through and browning on edges. 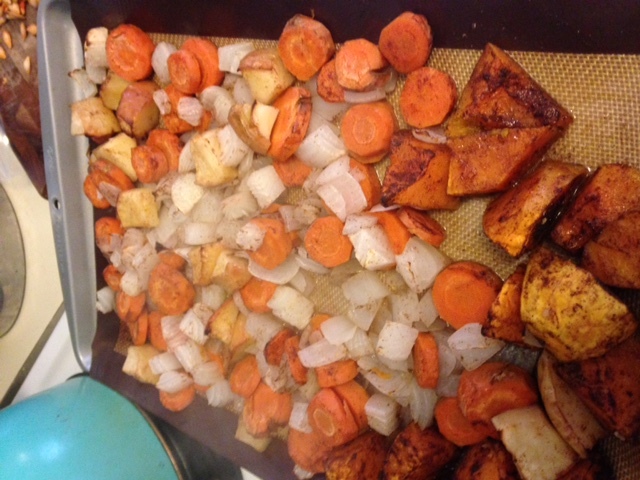 In a large pot, add water and all roasted veggies. Heat on high until bubbling. Cover and let simmer for 20 minutes. Option 1: If you have an immersion blender: blend mixture together until desired consistency. Garnish with cinnamon and toasted seeds and enjoy! Option 2: If you have a regular blender: Add half of liquid and half of veggies to your blender and blend until desired consistency. Transfer blended mixture to a large bowl. Repeat blending with remaining ingredients and transfer to the bowl or pot. Garnish with toasted seeds and cinnamon and enjoy! Note: If you prefer a “runny” soup, add more water or milk and let simmer longer. Also, rinse and roast the seeds with a little olive oil and salt for 15 minutes, for a fun topping. Will definitely make this again. Definitely. 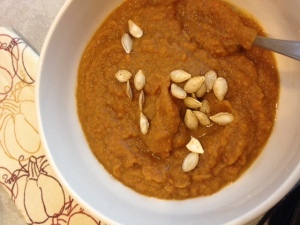 Now to convert my husband to loving squash…and thanks to you all reading my 300th blog post. Wow, that’s crazy.